ROLLING MEADOWS, Ill., July 15, 2010 -- Northrop Grumman Corporation (NYSE:NOC) today announced the delivery of over 300 surplus network and desktop printers, in addition to toner and supplies, to the Chicago Public School (CPS) District which serves 400,000 students in over 650 schools. "Over 75 different schools across all regions of the city will benefit from the company's donation," said Michael Manning with the Department of External Affairs and Partnerships at CPS. "This equipment is a vital contribution that will serve the schools well. We are always appreciative of individuals and organizations who step forward to support our students through donations." 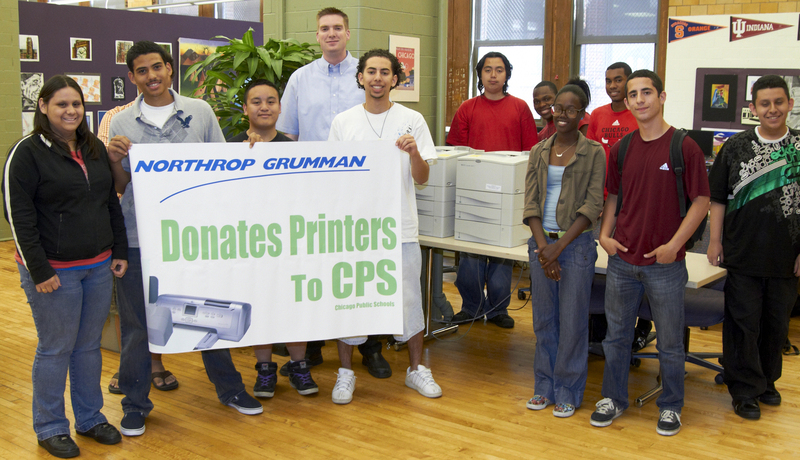 "There is no better way to give back to the community than by supporting educational institutions in the Chicagoland area," said Jeff Palombo, vice president and general manager of Northrop Grumman's Rolling Meadows-based Land and Self Protection Systems Division. "Northrop Grumman is committed to helping our leaders of tomorrow succeed by providing vital resources to enhance their educational experience."